Most of the Gig Disks refer to styles (preset or external) that have been tuned for particular songs. You can also use registrations to capture the changes needed in preset styles to modify them for use with particular songs. Jim's registrations were originally developed for Tyros3 styles and now have been updated for use on the Tyros5. If you have a Tyros3 or a Tyros5, you will be able to use these registration banks directly. For other keyboards, you can use Murray Best's Registration Manager to convert the registrations for use on your keyboard. 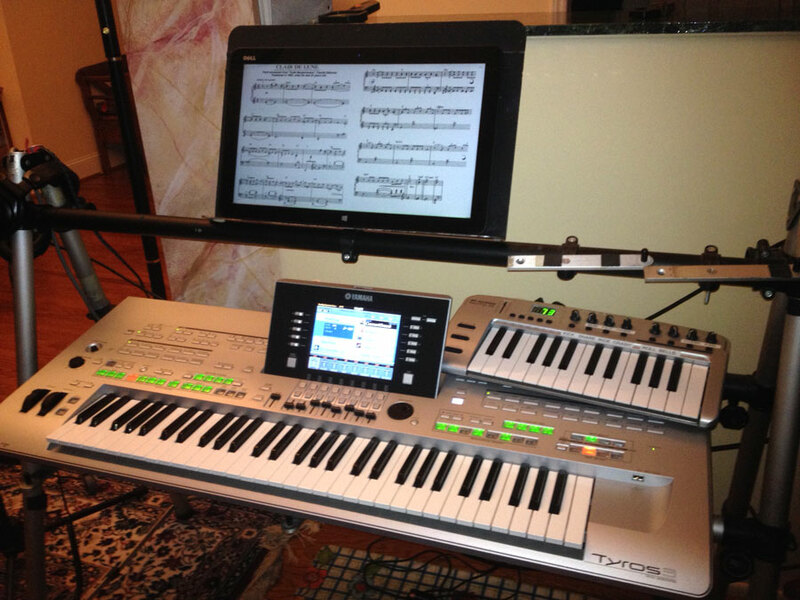 I originally created my registrations on a Tyros3 and then updated them for the Tyros5. Both the Tyros3 and Tyros5 versions are provided below. Each "Registration Bank file" contains 8 registrations (one for each button on the keyboard). I'm hoping others will find some of them useful. Of course, a registration and the specified settings for songs, are "personal" and so not everything will work for everyone. But they are here in case anyone wants to try them! Cllick on the section titles below to open/close the section. The first two sections contain a brief description of the registration set and the downloadable zip files. The "User Notes" section includes some comments that apply to both registration sets. These registrations include a few of the songs I have memorized and play for folks at the local Retirement Homes, hence the "RH Mem" in the registration filenames. The table below shows the songs covered in each of the 8 registration bank files. The zip file includes the 8 registration files and some support files (lists, info etc) The files you want to copy to your keyboard are the .RGT files. The "Band" stands for "these are registrations that I use with my duo/trio band." These registrations are a few of the songs my band plays. This band includes two vocalists, one guy plays acoustic guitar and the other an electric guitar. For the duo, I often play the "electric" guitar sounds on the Tyros, hence you'll see a lot of electric guitars in Voice R1/R2/R3 etc. The zip files below include the registration files and several support documents. The registrations are for three "Sets", each in multiple parts: Set1 (A,B,C), Set 2(A,B), Set3(A,B,C,D). Generally there are 13-14 songs in each set part. So, for example, Set 1A will have two registrations files: "Band Solo - 1A-1.rgt and Band Solo - 1A-2.rgt). Click here for a pdf list of all the Band registrations. I have 3 registration banks for 20 Italian songs. The contents are shown in the table below. The Tyros5 and Tyros3 zip files include the three registration banks and several documentation files. Here are 2 registration banks with 13 Irish songs. The contents are shown in the table below. The Tyros5 and Tyros3 zip files include the two registration banks and several documentation files. (August 2014) Here are two more sets of registrations banks that I call "MISC" and "XTRAS." They are a mixed bag, so to speak. Various kinds of music, not all one kind. The Tyros5 set has 5 XTRA banks with registrations for 38 songs and 10 MISC banks with 68 songs. The Tyros3 set is similar to the Tyros5 set although it has 10 fewer songs. Click here for a pdf list of the Tyros5 or the Tyros3 sets. The zip files below contain all the registration banks and documentation files. Some notes that might be helpful to others using these registration files. Don't know if it matters, but I use FINGERED mode for chord recognition. I do have 2 custom voices: the SA2 Trombone and the "Choir Pack". Other than that, most of what I use is built-in stuff. I've just customized in many cases by adjusting volumes, muting out some parts, etc. I use a few "purchased-from-Yamaha" styles, but probably 95% of the time I use the built-in ones. I have a small 2-octave keyboard that I use to play the R3 voice. It gives me very quick access to this sound w/o having to press any buttons on the Tyros. This isn't required to use my registrations though; you can use R3 as you would on an any Tyros. 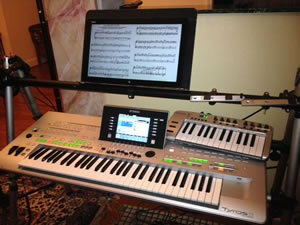 The photo shown here was my setup on the Tyros3. I tend to do more than just play chords with my left hand, so I often have sounds with some decent volume to them. That is, I play rhythmic patterns, runs, "passing tones" kind of passages, etc. with my left hand, depending on the song's needs of course. There may be a very small number saved with ACMP off (I turn it on once I play an intro or 1st verse of a song) - but I think 95% of them should have full ACMP on (although I sometimes mute one or two accomp. parts to simplify the style a bit). These styles all started on a T3, then the T5 version was modified and re-saved on a T5.